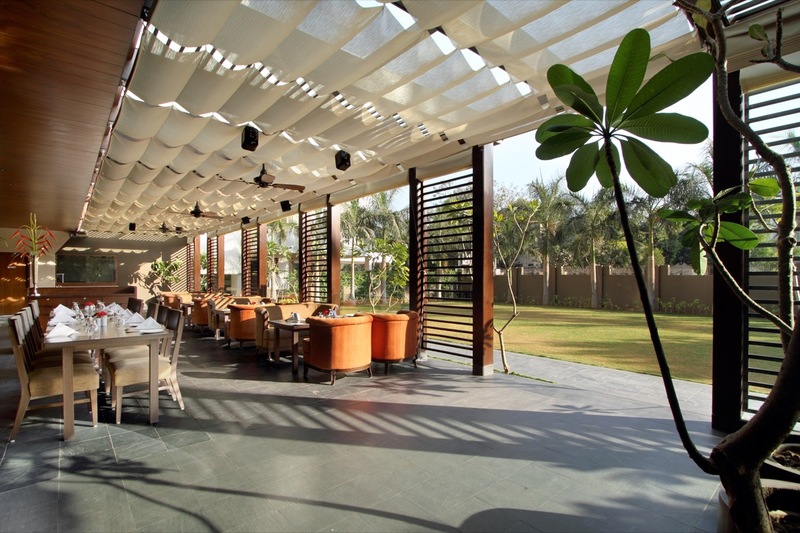 Fiorella and Bay Leaf - Restaurant at Vadodara by Dipen Gada and Associates - ArchitectureLive! The project challenged the renovation and extension of a famous hotel restaurant of Baroda which the DGA took sportingly with the medium they are famed for- Minimalism & Simplicity. The project is a living, breathing space with a unique feature and concept portraying the cuisine philosophy with austerity and authenticity. The design is simple, with clean straight and stark lines carving the frame for the perfect classic ambience that the basic elements create within highlighting the interiors with marvelous sciography. The restaurant serves multi-cuisine segregated into three major cuisines, with each depicting different character. There are two major cuisine, Italian and Indian where the former is served in the inner restaurant which houses 2′ thick bare brick walls on one side and fabric finished walls on the rear end bringing out the rustic and earthy texture harnessing the warm and gloomy ambience suiting the mood and purpose of the space. The partitions are also made with natural materials and the grill that they endorse is custom made for suiting the effect created by the elements working together for exquisite aesthetics. 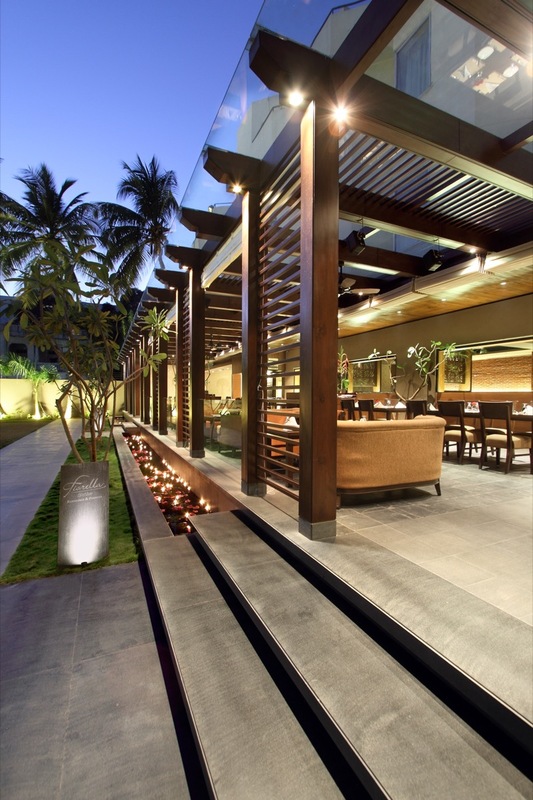 The Indian restaurant constitutes semi covered and covered areas that roofs the wooden furnishings and lamps that are specially tailored to meet the desired effect. The motif used for the wall textures and the lamps are carefully considered to blend with the ambience and outlines the beauty of the elements on which they endure. The most enchanting is the front, semi-covered area reserved for the multi-cuisine. The front facade stretches up with a huge 7516 sq. ft. garden and a patio roofed with metal and wooden members which run along the ceiling forming spaces of alternating pergolas. 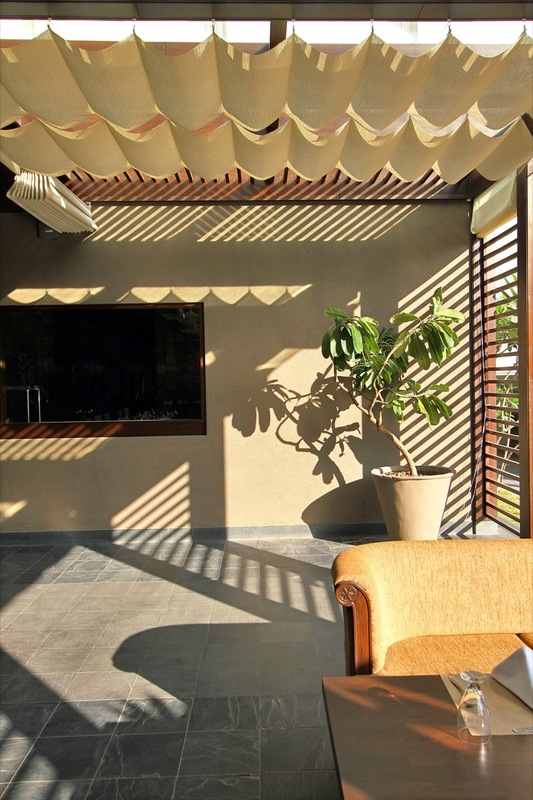 These pergolas are guarded with wavy curtains to shield the inside from the harsh sun during the daytime. The facade is painted on rough unfinished plaster avoiding treatment to emphasize the rustic effect felt virtually matching the footpath outside leading to the restaurant which is river finished granite and slate. The materials are all natural that bring out the rustic effect consciously driven by the designer to strike a perfect balance of soft, calm and refreshing ambience for the guests at all times of the day. 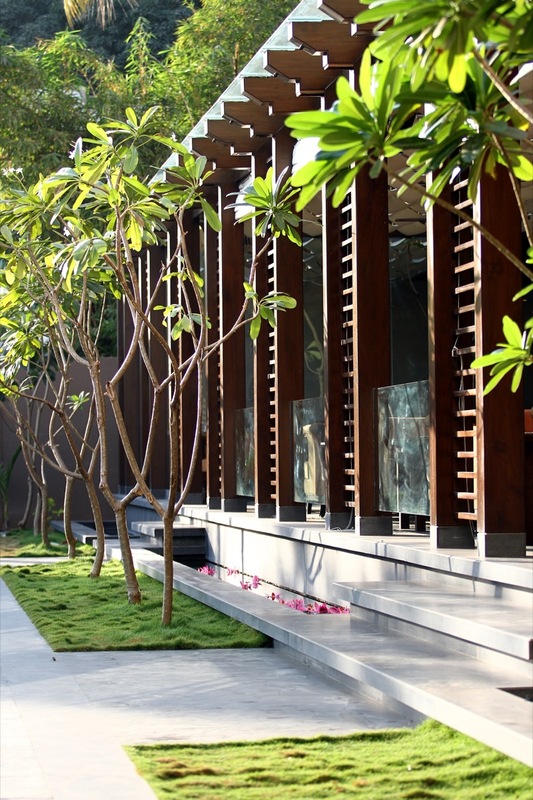 The choice of wooden and metal members enhances the earthiness oozing serenity. The indoors flood with beautiful array of patterns created by the play of lights during the day and glows with warm lights at dawn. The strokes are perfect, radiating and meticulously rendered with the sharp straight members encasing the area. The feel of the outside is carried inside by the subtle transition of the patio abutting the lily pond which is symbolic of soothing and pure experience completed by the garden view. The spaces here are designed in a manner that achieves maximum functionality with the flawless ambience to attain a wholesome experience.